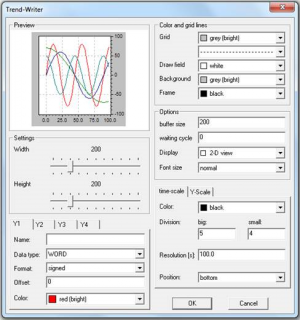 The trend writer displays the graph of the connected numeric signals over a period of time. It is possible to connect up to four signals, which creates four different chart lines. The horizontal scale always represents the time progression of the system (measured in seconds). The sampling rate of the input signals is determined by the relation of the buffer size and resolution (see parameter dialog). The resolution depends on the width of the display field and the range of the time scale. The cyclical read rate is selected by the function block in such a way that during the period of time defined by the time scale the whole ring buffer is filled with values. Therefore the values are read more frequently at bigger ring buffers and the representation is more detailed. However, the sampling rate is limited by the adjusted refresh rate. The cycle time cannot go below the minimum of 50 ms even with large ring buffers. To avoid permanent moving and to get a better representation, especially by higher sampling rates, the number of waiting cycles can be increased. This influences the number of values to be written into the ring buffer until the next update of the display. The size of the function block can be defined. The data type and the display color of the four different input signals can be selected and a name can be given. The colors of the function block components (drawing area, background, and frame) and the gridlines can be selected. The buffer size defines the number of elements internally held. A number of wait cycles can be entered to ease the behavior by higher sample rates. The properties of the time- and the Y-scale can be given. For the former the time resolution and for the latter the minimum and maximum value can be defined. Finally the general display mode and the font size for the labels can be selected. Like already mentioned, the sample rate is limited by the refresh rate. This value can fluctuate depending on the performance and the work load of the PC. Therefore fast changing signals can only be covered inadequately with the visualization blocks.